What Happens If You Don’t Want Matching Wedding Rings? It could be that you have both reached an agreement that matching wedding bands just don’t suit you, and you would prefer rings that suit your own skin colouring, personality, and taste. There are options, though, that you can consider before entirely dismissing the idea of having matching wedding rings. For instance, proportion may be a problem, with one style perhaps appearing too elegant on the groom’s finger or just too chunky or it may be overwhelming on the bride’s finger. If this is the case, you may want to consider asking your jeweller to show you several matching sets that have been scaled to various widths. Check out Certified Diamond Network in Sydney for a range of sets and individual wedding bands. But, if proportion is not a hindrance in your decision, perhaps you could ask if the jeweller offers a custom design service where both you and your significant other could design a matching set that you both love and agree upon, and can take pride in having designed it together. If you are still struggling to decide on a matching wedding ring set, it’s possibly time to start compromising. Complementary rings, instead of matching ones, may be the ideal solution for you and your fiancé. Jewellers are able to show you a wide range of choices, such as two bands made from different metals that have the same style or even two bands with identical metals and different styles. For example, a band that has three diamonds set vertically across its centre will look classic and elegant in yellow gold. On the other hand, it will look better on men if it’s made of grey tungsten. 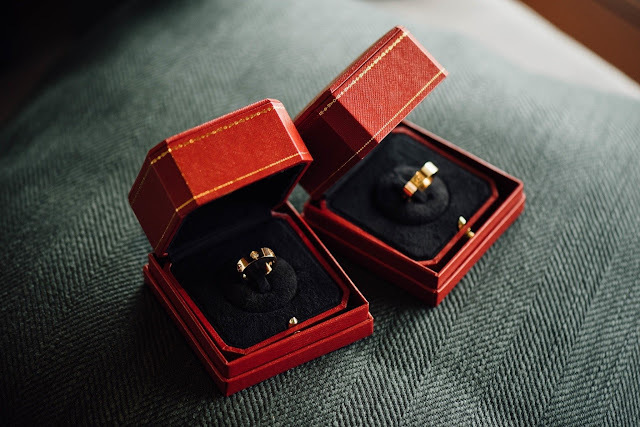 If you find that one of you prefers simple designs while the other loves details, pick rings that look the same but where one is made of gold and the other has an inlay of a different metal or a textured-appearance. Some brides also prefer to have an eternity ring that has diamonds going all the way around. If that’s the case for you, the groom may need to think of having a diamond wedding band adorned with 3 stones that have the same size as the diamonds set in the eternity ring. Essentially, only you can decide what type of wedding band will make you pleased, and only your fiancé can make that decision for him or herself. It’s up to your taste and preferences.